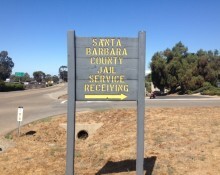 Santa Barbara County Jail | Arrest, Jail & Bail Bondsman Info. Santa Barbara County Jail | Arrest, Jail & Bail Bondsman Info. The Santa Barbara County Jail houses up to 640 inmates at one time. They receive pre-trial inmates from local substations as well as sentenced inmates both male and female. The Calle Real location is the main jail for the Santa Barbara County and provides a full medical staff (including psychiatric). Many of the pre-trial inmates housed here are eligible for bail. Visiting hours will depend on the location of the main jail. In order to find out when you can visit a friend or loved one located at the Santa Barbara County Jail, it is best to begin by calling inmate records at: 805-681-4260. When you need bail bond assistance, we are always happy to help. A friendly, knowledgeable bail bondsman is always available by phone to answer your questions and help you navigate the legal system. We are available 24/7 at 805-874-BAIL (2245) or toll-free 855-414-BAIL (2245). The cost of a bail bond in Santa Barbara will vary depending on the total bail amount that is set for an individual. Bail in California depends on the number and severity of the crime(s) he or she is charged with, among other factors. Most people aren’t aware that there are additional options for release from jail aside from a bail bond. These options include: O.R. (Own Recognizance), Property Bonds, Cash Bonds and Citation Release. If you’d like to know more about the additional options for release, give us a call! We’re glad to help and our consultations are always free. If you’d like to begin the bail bond process for a friend or loved one located in Santa Barbara County Jail, call us today, locally at 805-874-BAIL (2245) or toll-free at 855-414-2245. We know this can be a stressful time and we’re here to help you through it.